I trust you have had a good week and looking forward to the wknd? Have any exciting plans for the first weekend in February? As some of you have received my new pricelist in the salon, the rest will get yours as I see you during the month. If you wish to take an extra one to hand out to friends or family please don’t hesitate to ask. Please note that I will NOT be taking on new nail, pedi or manicure clients as I would like to focus on my facials and waxing from March 2018. I will be doing manicures, pedicures and nail treatments for February still at the old pricing but from March they will be taken off my price list. How wonderful has our weather been. I really hope you all had rain on Saturday evening and that we will still get a lots more days of rain. I trust you are well and I’m sorry I’m sending this email so late into the month, last week was a tad of a nightmare for me. The salon has started to get busy now again and I’m so happy to have my business back. Thank you for your unwavering support and love for my little boy. I do hope you don’t mind seeing him every time you come to the salon, he needs the social skills and development. It’s now getting to that time again where December starts getting busy. Please start looking at your calendars and lets book your December appointments soon. I will be closing Tuesday 20 December 2016 so this will be my last working day for the year. I will be changing a few days at the end of the month, my parents are going away and my nanny is not available to help look after Declan, so I will be messaging those I’ve booked appointments with to just shuffle around to other days. 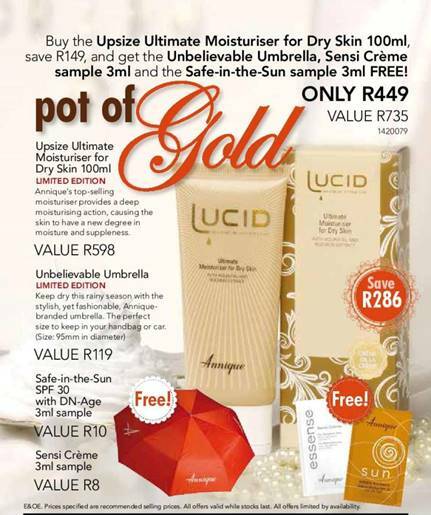 I am offering a 5% discount on all orders over R500 with Avon. If you are looking for an extra income or tired of your job and would like to work for yourself, please chat to me about selling Annique and Avon and start doing something you enjoy. I am terribly sorry this email comes a few days late, I was surprised with a holiday for my five year anniversary and last week being back was a little busy. I do hope this email finds you well and happy, and warm. I saw on the news yesterday that we have been elated to a heat wave warning for this week, so please stay hydrated and out of the sun if possible, heat stroke is a serious thing and can cause headaches, dehydration, kidney issues and many other symptoms. So with 11 weeks until Ro’s Beauty spot closes for December break I am already starting to get full and busy the last week in December. my last day of work will be Saturday 19 December, so please check your diaries as to when you go on holiday and lets book your appointment now. I always tell people that it’s so much easier to move an appointment then to make space for a new one. Remember too that it’s on a first come first serve basis. Then I have some very exciting and special personal news…for those of you whom I haven’t seen or haven’t had a chance to tell I am 14 weeks pregnant today and carrying a healthy little baby. Dale and I have been on a long journey to starting a family and this has come as such good news for our family and our lives. So with that I do need to ask that you be patient with me, I seem to be suffering a little with porridge brain and need a few reminders if I don’t get back to you or forget something. Also I have been instructed in the heat to be taking some breaks during the day to keep me and my baby healthy. So I will not always be taking back to back appointments and may need to ask if I can quickly eat something or drink something between clients. My baby will be due end of March/Beginning of April, due date is 5 April 2016 and due to the nature of my business and how special all of you are to me I will try not to be taking too much time off, and will discuss this with you when I see you in my salon. Please if you have any questions don’t hesitate to ask. 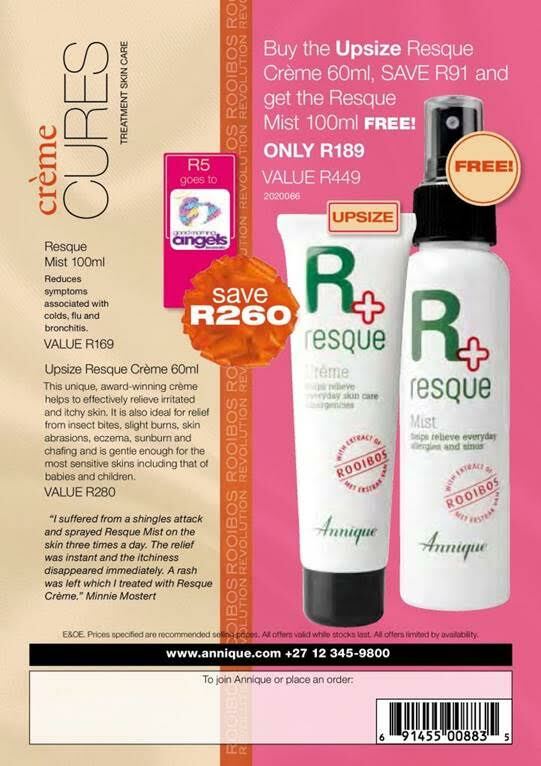 Upsize ResQue Cream 60ml for only R189. Please make sure you stock up for Awesome Christmas gifts and for yourself. 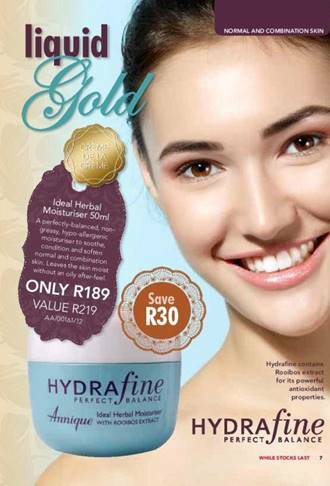 The Lucid, HydraFine an Synergy Fresheners are on offer this month and Come with a FREE Hand Cream valued at R59. Its hydrating, softening and packed with Rooibos to boost the anti-oxidant levels in the hands-fights aging and sun damage. 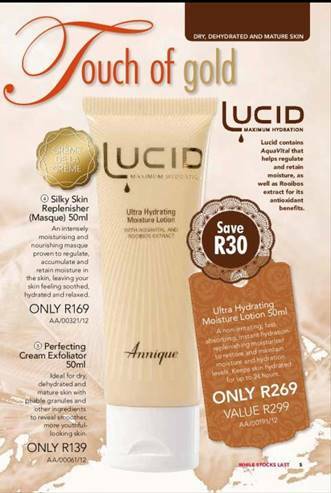 The Lucid, HydraFine and Synergy Night Creams are also on Offer with a saving of up to R51. Please download the Beauté to view the complete catalogue and share with your friends and Family. I’m still offering a 10% discount on your order when you refer a friend to buy Annique From me and they spend more than R250. Don’t forget the salon is closed on Tuesdays unless otherwise stated. How wonderful is this rain we having. Now summer can truly begin. Wow so 2 months left of 2014, hope you’ve started to plan Christmas Shopping and your holiday plans are done. October was a fantastic month for new Annique sales into my little Annique Family. I welcome you and know you will love and enjoy Annique as much as I do. Please don’t forget to ask me anything, I will respond as soon as I can with the best answer I can. I’m always here to hear feedback, help with conditions or problems or just to hear how your skins and bodies have improved with the help of the Annique Range. Just a reminder that my last order is normally around the 25th of the month, Annique have a deadline and cut-off date for orders, so I normally WhatsApp everyone to let them know when my last order will be, please if you do want stuff, please reply and let me know. Payment can be made on collection or after you get paid, so don’t worry about that, will sort that out. But I never want you to go without a special or miss out on the items you need because of this cut-off date. This Upsize Special is R440 when you order with me, and comes with a branded umbrella, a 100ml Moisture Dry tube and samples of some of our other creams. So you definitely don’t want to miss out on this one! Then we launching a brand new Serum this month…. 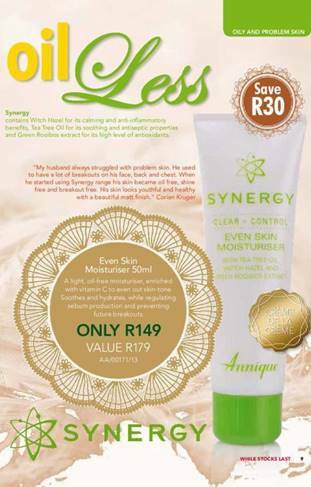 The Anti-Redness Serum 20ml For R250. This unique, breakthrough formulation contains the stateof-the-art ingredient Pro-Immune X Antiinflammatory Complex that is clinically proven to increase cell renewal by 31% in 7 days, reduce skin reactivity by 37% in 7 days, reduce bacterial growth by 54% in 28 days and increase rehydration by 17% after 1 application. Now are those not stats you want you trust and try. Gets yours this month and avoid the redness forever. Then for the rest of our amazing specials and promototions. Please download the Beaute BY CLICKING HERE or if you would prefer a hard copy please get one next time you in the salon. And a warm winter welcome to you. I trust you are having a good week, mine has been great so far. I’m enjoying the good warm weather…a little nervous for the end of the week when I believe it’s going to get chilly. So make sure your electric blankets are on your beds and that you have warm socks ready for the weekend. To all the mothers out there I hope you had a wonderful mother’s day? To all the fathers I wish you a happy father’s day. I’ve had a few queries regarding dry feet and cracked heels so this newsletter will be about “them feet”…and how to help with the dryness and cracked heels this winter. Lack of moisture is one of the most common causes behind dry, cracked heels. Other causes are standing for long hours, use of harsh soaps, dehydration, cold chilly winter weather, continuous exposure to water, weight gain or being overweight, wearing incorrect shoes (heels, poor quality shoes, sizing of shoes), psoriasis, thyroid disease, diabetes and so on. Some of the signs and symptoms of cracked feet are red or flaky patches, peeling skin, itchiness, bleeding from the cracks, pain and so on. Before going to bed, take half a bucket of warm water and add some liquid soap in it. You can also add lemon or peppermint drops to the water. Now soak your feet in this warm soapy water for up to twenty minutes. Once soft, foot file gently to remove some of the dead skin. This is a process treatment, so a little every day. Do not remove too much skin, otherwise the feet and heels will become irritated. Rinse feet after and pat dry. Once dry, apply a good amount of heel balm or body butter to the area. 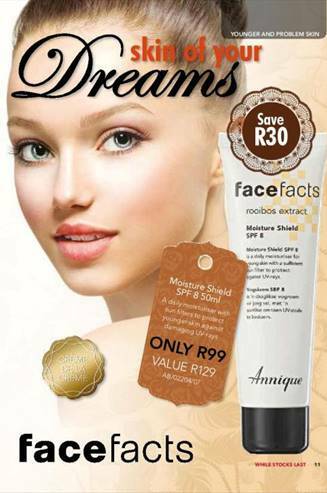 Annique ResQue cream will also work wonders. Cover the feet with soft cotton socks for a min of an hour. If you can sleep with them on, even better! In the morning reapply cream and wait a few min before walking around too much to allow maximum absorption. With a dawn of a new month 2012 has definitely started off busy! Well at least February will have 1 extra day so maybe we can try get a few more things done! I trust you have had a good year so far, looking forward to February and that there is plenty of Love in your Air? For me February is a month of realization, where I can actually set goals and start focusing on them. For those who have seen me this year I’ve been speaking a bit about working a little less. I do apologise if I seem to be repeating myself and it’s not meant to upset anyone, but I feel I need to reiterate things a few times for everyone to catch up! I am not cutting down my hours to hurt anyone but its something I need to do! I will be cutting down some of my hours-namely those on Saturdays. I am now going to be taking off 2 Saturdays a month in order to fill my Saturdays that I do work and are open. This means that I have limited space on a Saturday and if by any chance you do need to cancel your appointment, I may not be able to able you the following Saturday, which means you may need to wait a few weeks in order to get another Saturday appointment! Also this means that you need to book well in advance for a Saturday. From 1 March 2012, Voucher redemptions will no longer be accepted on a Saturday either. I apologise if this causes any inconvenience and I hope you understand. Then as of 1 April 2012 the price of Annique Products will be increasing, it’s usually between 7 and 10% and its not always on all the products, but I will be sending out the new pricelist as soon as I receive it. In September 2011 I changed over to the Depiléve Wax system for legs and arm waxing. I have also started selling their Intimate Folisan – a roll on gel that works wonders with ingrown hairs in the bikini and under arm area. I have received great comments and happy results. The 10ml roll-on gel is R60 and needs only to be used until the hairs have started to push through the skin. As soon as the hair has appeared through the skin, stop usage until after your next wax. So use will be between 10 and 12 days. Please enquire about the product when you visit. Also another fantastic product for Ingrown hairs is the Annique Body Wonder Sponge. 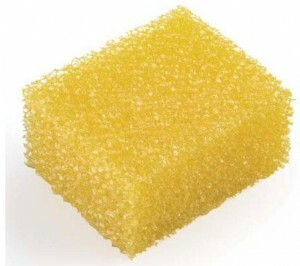 This hygienic rough body sponge helps remove dead skin build up, increase blood circulation and helps lift the ingrown hairs trapped under the skin. To be used a daily basis, a day or 2 after waxing, when the skin has calmed down. Then The Annique ResQue Cream is also a great comfort and healing product for ingrown hairs. Its helps reduce inflammation, sensitivity after waxing and promotes healing. It needs to be applied to infected areas as often as possible. 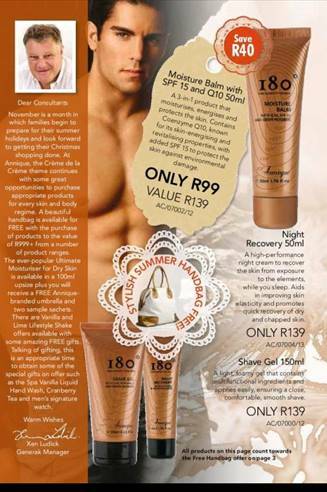 Or The ResQue Cream comes in a 60ml tube at R95. Annique’s ResQue cream can be used for a number of skin issues such as Eczema, dry skin, sun burn, rashes, grazes, scaring and cracked heels. So I wish you all a Love Filled, positively productive February and thank you for all the support and friendship. Yes we have made it through 3 hectic months of 2011 so far and hope this year has been going well for you! Due to the fact that I need to order a larger amount of Annique products every month I have started to accumulate too much.